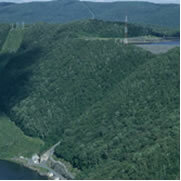 The Bear Swamp facility is situated on the Deerfield River in Massachusetts and includes the Bear Swamp Pumped Storage Plant and Fife Brook Station. With a generating capacity of 573 megawatts and the ability to start up quickly in response to power demand, the pumped storage plant provides an important supply of electricity during times of peak energy use. The pumped storage facility is located in Rowe, Massachusetts. Fife Brook Dam forms the lower reservoir for Bear Swamp. Located in Florida, Massachusetts, it is a conventional hydroelectric station and provides 10 megawatts of capacity. The facility's grounds include an area managed as a state tree farm, as well as popular recreational spots, such as the Dunbar Picnic Area and places for fishing and whitewater boating below Fife Brook Station. The Bear Swamp facility uses two reservoirs to store and harness power for peak electricity needs. Water released from the man-made upper reservoir falls almost 770 feet through tunnels inside of the mountain to the lower reservoir, driving two reversible turbines in the powerhouse. At night, when electricity demand is lower, the turbines are reversed and water is pumped back to the top reservoir — ready for the next day. The Bear Swamp facility is managed and operated by an affiliate of National Energy & Gas Transmission, Inc.